IIEC-India was recently honored with the SABERA Award (Social and Business Enterprise Responsible Awards) for its CSR work on Clean Energy Access in Uttarakhand under Award Category: A- A1: Paryavaran (Environment) in December 2018. IIEC-India successfully implemented an on-ground project for improved health services for socio-economic development in the state of Uttarakhand in India. 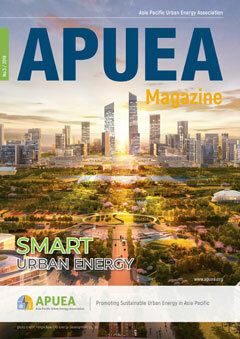 In the third issue of the APUEA Magazine, it includes smart green buildings and an introduction to the green development of a new city and learning on how smarter cities is a part of the future. It also presents a digital roadmap for district energy and looks into how sustainable urban growth can be achieved. The Magazine provides an Energy Outlook of Bangkok, being one of the megacities in the Asia Pacific and updates on recent APUEA activities.